This extreme image of the potential ferocity of the human will is softened by Rhudyar who states it boils down to “the aggressiveness of human instincts when fighting for their earthly base of operation.” He suggests this symbol implies that violence and aggressiveness are basic components of human nature at the emotional level. As a reflection of the phase in consciousness represented by Taurean energy, these intense emotions are often inappropriately mobilized in moments where the acquisition of earthly goods is concerned. In Taurus, the fixed Earth sign of the zodiac and the first yin polarity of the wheel, we begin to understand ourselves through our desire nature. This extends materially to objects, skills and experiences that we desire to possess, and also has a profound connection to money as a resource that enables our acquisition of goods. Here it is useful to contemplate the bronze bull statue that graces Wall Street, the financial hub of our modern world. The bull is, of course, the symbol of Taurus, and displays at once the hard-headed and deliberate forward plodding of human desire that has served to create so much and yet has also symbolically scalped men and exploited too many for history to count in the name of greed and the material power inherent in acquiring huge amounts of wealth. The desire nature is developed and internally experienced as the planetary energy of Venus, goddess of pleasure and the inner harmony that exalts through receiving abundance and the objects and experiences we see as somehow being necessary for our definition of self (remember that Taurus follows Aries, the sign presiding over the initial contact with our individuality, and serves to extends this individuality into worldly possessions). Venus works in unison with Mars, the principle of the inner warrior who works with the strength of our will to project the necessary energy into the outer world that is needed to obtain, acquire and conquer in the pursuit of our passions. If we refer back to the Sabian symbol we see very clearly the extremes that our Mars energy can go to in order to satisfy the desires of Venus, whether it be on an individual level, or the desire of our nation in the case of war. Venus presides over money and luxurious material goods through her earthly manifestation in Taurus, however the role of Venus in our individual and collective lives is imbalanced without her airy function in the sign of Libra, where she enforces justice, equality and the active pursuit of humanitarian values. Here, Venus rules social politics and influences our attitude in the relationships we form to one another as individuals. Without these Libran attributes, the role of money has been extorted from its simple function as a form of divine compensation in exchange for expended energy and services received, into the primary resource that drives the majority of human greed, crime, exploitation and segregation. However, one major celestial event that is occurring on the same day as the New Moon in Taurus promises that our understanding of money is about to radically shift. That event is the planet Uranus’ ingress into the sign of Taurus, where it will be stationed until April 2026. Uranus is the planet that signals collective liberation, revolution, and the breakdown of illusion. Uranus is also the esoteric ruler of Libra, which brings an interesting flavour to the Venusian dynamic considered above. The next 8 years will see a major shift in way we understand finances, personal possessions and the relationship between our self-worth and our ability to successfully trade our services for material abundance. Likely many more people will start to liberate themselves from the 9-5 and enter entrepreneurial fields, and ethical and humanitarian businesses will begin to reign through collective preference, a shift that will slowly begin to break down the capitalist cruelty that has dominated business for the last 100 years. It may take some time, but divine support is in favour of our financial liberation through the internalization of our true worth and our identification with the services we can successfully provide to the human collective. In order to assist the divine plan towards this end, it is important for us all to individually consider the ethics of our relationship towards money and to get very clear on what we deserve to receive based on the skills we have acquired and what we can provide for the human family. Most of all, it is important for us to overcome the fear that has been conditioned into our way of thinking of about the independent acquisition of financial stability and wealth. The planets have aligned in our favour to celebrate our individual ability to assist in changing for the better the world's relationship to money. This New Moon falls in your second house of finances, resources and self-worth, Aries. This is the natural house of Taurus in the horoscope and makes this moon especially potent for you to influence this particular area of your life. Set your intentions for the prosperity and abundance you’d like to attract, and be mindful of your internal dialogue around self-worth. Are you limiting yourself from receiving the abundance you desire from the outside world because of an inner belief around your worth or ability to monetize your skills? If you find yourself struggling, you can help to rewire your inner dialogue around money by using wealth affirmations and researching the spiritual laws of money. 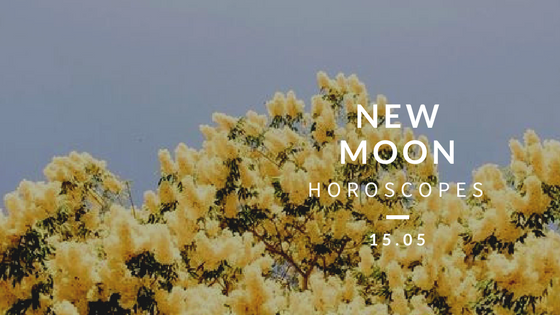 This New Moon falls in your first house of self-initiated action and self-knowledge, Taurus. Take the last week of your sign's season to explore your authenticity to the fullest and to get clear on what makes you a unique individual apart from the rest. Set your intentions for how you’d like to embrace your quirks and differences, in recognition that this is an essential step to mobilizing the path of self-realization. This New Moon falls in your twelfth house of spirituality and deeply subconscious emotional/mental patterns, Gemini. Take some time for yourself during this moon to be mindful of what you need to release in order to move forward. It may be something that has occurred recently in your life, but likely it also involves some very old wounds that are asking for your attention so that you can move forward in a new definition of self. Set your intentions for how you want your spiritual growth to inform your life direction and temporarily step back from your outer world engagements to make the most of the current energies at play. This New Moon falls in your eleventh house of long-term goals and friend networks, Cancer. Set your intentions for the kinds of like-minded individuals you would like to meet and collaborate with in order to move forward with your personal long-term vision of success. Even individuals whom you wouldn’t expect to be able to contribute to your journey may have something valuable to offer so embrace the unexpected surprises that may be in store for you. This New Moon falls in your tenth house of career and life purpose, Leo. Set your intentions for how you would like to move forward in your passionate quest of self-expression in the area of career. There is an opportunity here for public recognition of your journey, skills and talents so be open about what you have to offer. Focus your energies in order to achieve mastery in this area of your life and you will be rewarded. This New Moon falls in your ninth house of higher learning and belief systems, Virgo. There is potential here for you to reach new heights of expanded consciousness and awareness based on how much you can open yourself up to understanding the Godhead as it expresses itself on the Earth plane. Set your intentions for the knowledge and experiences you’d like to invite into your life in order to achieve this higher level of knowing within yourself. This New Moon falls in your eighth house of endings, transformation and personal empowerment, Libra. You’ve likely been dealing with some extreme experiences in the last few weeks that have either served to strengthen your sense of personal power, or have revealed to you what mental and emotional patterns are keeping you from fully stepping into the knowledge that your true potential is equal to the creative potential of the Divine. Take some time to process what destructive emotional tendencies and negative thought patterns need to be released through forgiveness and surrender in order to accept these lessons more fully. This New Moon falls in your seventh house of partnership and marriage, Scorpio. If you are in a partnership, set your intentions for how you would like to elevate your connection to the next level of intimacy and equality between you and your partner. If you are not currently involved with anyone, set your intentions for the kind of partner you would like to attract and recognize the efforts that need to be made towards diplomacy and tact in order to bring this person into your life. This time can also be beneficial for new business partnerships and negotiations. This New Moon falls in your sixth house of health, work and daily ritual, Sagittarius. You are being presented with an opportunity to rewrite, through focused intention, how you would like to improve your mind-body connection through proper lifestyle practices, exercise, and your ideal work-life balance. If you find yourself experiencing messages of imbalance from the body, take into consideration your emotional-mental patterns to find the root of what the imbalance is trying to communicate. This New Moon falls in your fifth house of self-expression, creativity and romance, Capricorn. Set your intentions for how you’d like to express yourself creatively with less shame and greater confidence in your ability to radiate an energy that others will appreciate and be drawn to. Any tendency you have towards self-doubt and personal restriction can be more easily worked through and dissolved at this time so take advantage. This New Moon falls in your fourth house of your deepest emotional needs and home life, Aquarius. Spend some time doing nourishing activities and take time away from outer world affairs to connect with family or to indulge in self-care practices. Set your intentions for how you’d like to root more deeply into your emotional stability and see the ways your life could benefit from a daily practice of connecting to your deepest feelings. Recognize that they are ultimately your greatest guides to unfolding your destiny and embrace their potency. This New Moon falls in your third house of communication and learning, Pisces. You may find yourself more involved with neighbours and in conversations that touch on important subjects that you’re curious to learn more about. Set your intentions for the kind of knowledge you’d like to dive more deeply into and celebrate this highly social and communicative time in your yearly cycle.